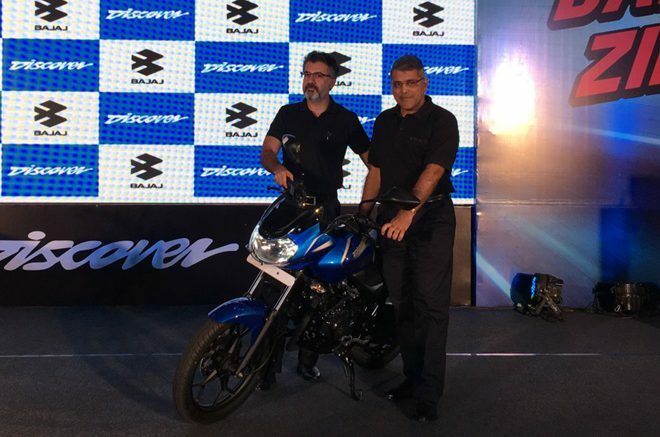 Bajaj Auto Limited (BAL) today launched the new Discover 110 and Discover 125 models during a press conference in Mumbai. The latter has been priced at Rs 50,496, while the prior comes with a starting price tag of Rs 53,491 (both ex-showroom, Maharashtra). Both the new models look identical and quite familiar as they are based on the popular second-generation design of the Discover brand. However, gets some new elements and features like double LED DRLs (Day Running Lights). The new models can be expected to carry forward the tradition with the successful design, claiming an improved comfort level. The company says that the new Discover duo are also fitted with 16 per cent longer suspensions and extra cushioned seats that add to the comfort of day to day rides. Bajaj says that both the Discovers come with new long stroke engines for a torquey performance. The Discover 110 is equipped with a 115.5cc DTS-i engine which delivers 8.6PS and 9.81Nm of torque. The 124.5cc DTS-i engine of the Discover 125 churns out 11PS and delivers a peak torque of 11Nm. Both the new Bajaj Discovers feature a digi-analog instrument and cluster and shares similar cycle parts including telescopic front forks, dual shock absorbers at the rear and stylish split-spoke alloy wheels with drum brakes. The Discover 125, however, also gets an upper variant which gets a front disc brake and has been priced at Rs 56,314 (ex-showroom, Maharashtra). Both the options will be available in three colours – black, red and blue. The 110cc model competes with the likes of the Hero Passion Pro, Hero Splendor iSmart 110, Honda Dream Yuga, TVS Star City Plus and the Yamaha Saluto RX. On the other hand, the Discover 125 will rival the 125cc models like the Hero Super Splendor 125 (also the old-gen Glamour), Honda CB Shine and the Yamaha Saluto. With the new options, now Bajaj will offer six models in the affordable commuter segment including the CT100, Platina ComforTec, Discover 110, Discover 125, V12 and the V15. 1 Comment on "Bajaj Discover 110 and Discover 125 launched"